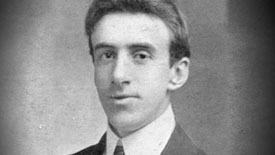 Wallace Hartley, the son of a mill worker, learned to play music as a student at the George St Wesleyan School and later played at a local chapel where his father was choirmaster. 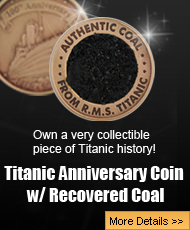 Survivors recount seeing the band playing even as water gushed on board, a scene which has been captured and recounted in most every telling of the sinking of the Titanic. Hartley perished in the icy waters of the North Atlantic, along with 1,516 other people. 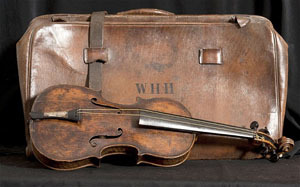 The violin was found in an attic in 2006, and was brought to the attention of Henry Aldridge and Son auction house. The auction house kept the find relatively quiet while they performed extensive testing on it to validate that it was in fact the same violin played on the ship. They worked with government forensic scientists and expert faculty at Oxford University. The firm U.K. Forensic Science Service identified corrosion deposits that would be consistent with being soaked in salt water, though to me that alone would not be sufficient “proof”. A silver expert studied the neck of the violin to validate whether such silver-work was consistent with that time era, which also came up positive. The violin is in generally excellent condition (especially when you consider its story!). It’s rosewood body has 2 long cracks, but other than that, its in good shape. It bears Wallace’s initials, along with an inscription from his fiancée, Maria Robinson. So If Hartley Perished at Sea, How Did they Find the Violin? A good question! Apparently, his body was found as part of the rescue/recovery effort mounted at the time (his body was found 10 days after the sinking). According to newspaper accounts at the time, his body was found with a large leather valise (presumably containing the violin), though official records indicate he was found with a fountain pen, 16 shillings, a silver matchbox, a gold cigarette case and some letters. The valise (and the violin inside) made its way back to his grieving fiancée, Maria Robinson (in bridlington, East Yorkshire). The violin somehow then mades its way to the Salvation Army. From there, it seems to have made its way into the hands of a violin teacher (an unidentified individual in Lancashire), who then seemingly made the connection and reached out to the auction house. The violin is expected to fetch around $500,000 at auction, making it the most valuable Titanic Memorabilia to date. Hartley was buried in Coine cemetery with the funeral attended by more than 30,000 people. The monument over his grave includes a violin and the opening notes of “Nearer, My God, To Thee” – the hymn that was reputedly played as the Titanic went down.